Can’t sew? 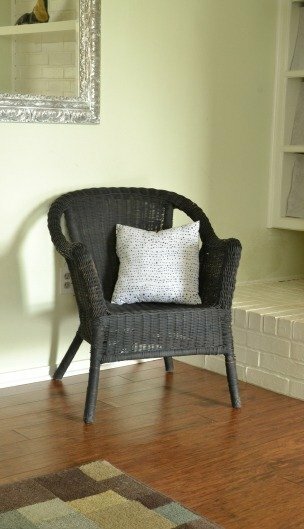 That’s totally fine, you can still make your own napkin throw pillows. I’ll show you how! A while back ago I saw the prettiest little pillows. They were white with little black dots and they just plain ol’ spoke to me. But they were from a store that we don’t have here in Oklahoma. Unfortunately they don’t sell online, either. And now, of course, I can’t find these suckers anywhere online. I’ll update with a link when I do find them. Geez! So knowing I had little other option, I DIYed some up. 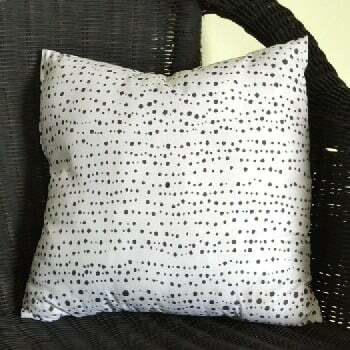 BUT I wanted to be able to create a tutorial for anyone who wants to make custom throw pillows but either doesn’t have a sewing machine, doesn’t know how to sew, or just doesn’t like to sew. Because sometimes people who have no desire to be crafty like custom things too! 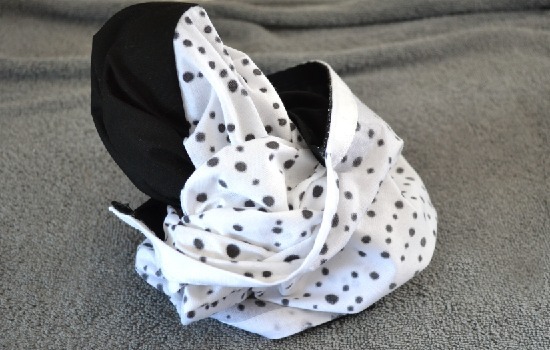 I purchased white and black napkins from Wal-Mart. I want to say they were just shy of two bucks for two. 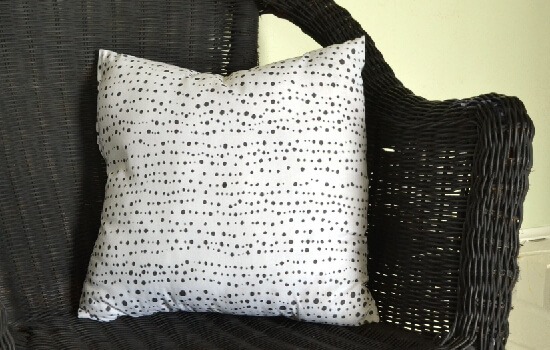 I used a black fabric Sharpie to draw the dots as close as I could to the ones seen on my inspiration pillow. 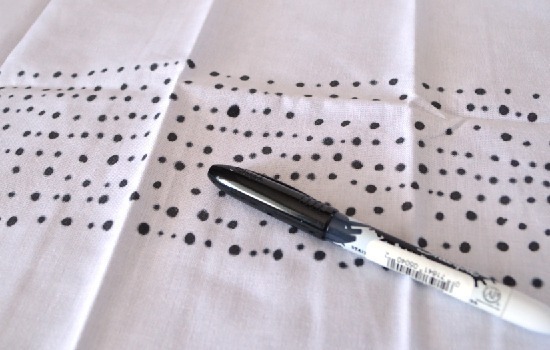 You can also purchase pre-printed cloth napkins in all sorts of fun patterns. Or you can purchase fabric by the yard and cut accordingly. Since this is an easy peasy project, I went with napkins so that there would be no measuring, cutting and all of that fun stuff. Here is the backside of my white napkin all drawn up and ready to go. Place the pretty sides toward one another and center your top piece as well as you can. As you can tell, my white and black napkins weren’t exactly the same size, but that’s no big deal. If yours are different, place the smaller one on top. 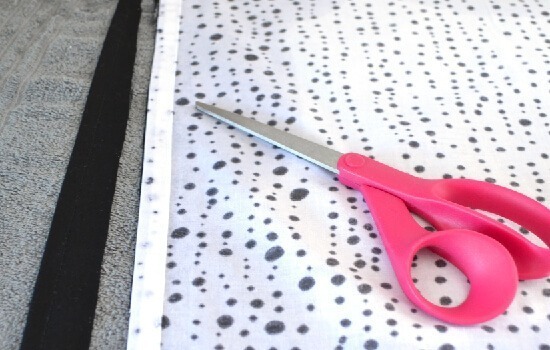 Take your stitch witchery and cut a strip the same length as your pillow. Place it as clost to the edge of the smaller napkin as possible. The thin mesh will be sandwiched in between the two napkins. 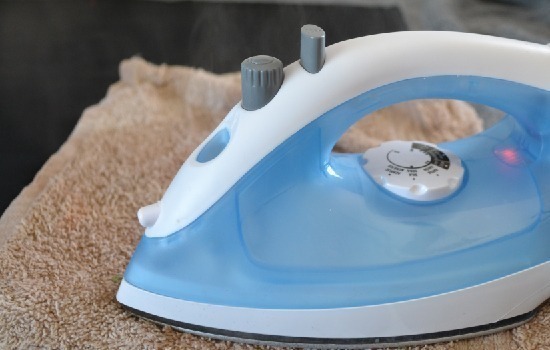 Take your damp rag and place on top of the edge where the mesh is just below and place your iron set on “wool” on top for a good 30 seconds or so. When you pick up the rag be very, very careful. This sucker is going to be hot! 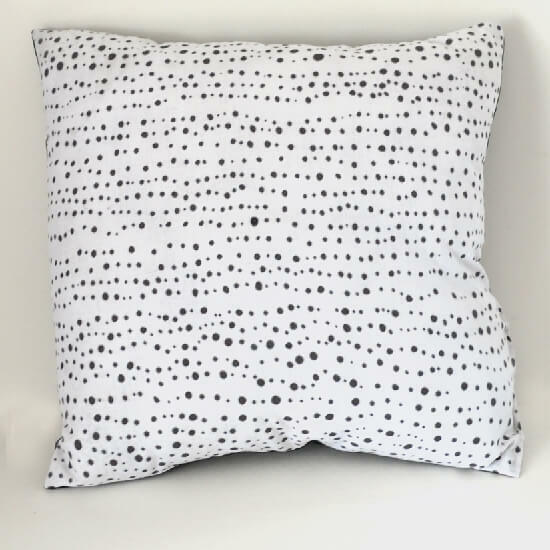 You may want tokeep a little shallow bowl of water on hand if you’re making several pillows because each pass with the iron will eliminate some of the moisture. You can typically rotate the rag so that you get four good presses each go. 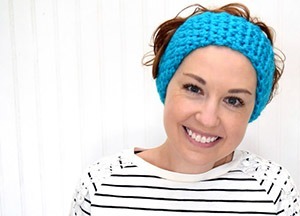 Rotate and go around the pillow leaving an opening about 3 or 4 inches wide. And trim the corners so that your seems aren’t so bulky. 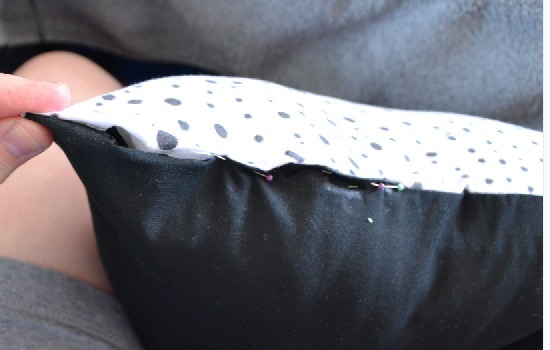 Stick your hand in through the opening you left and pull the fabric to turn the pillow right side out. You may need to use a chop stick or other implement to get the corners looking more pointy and less rounded. Now we need to stuff the pillow. 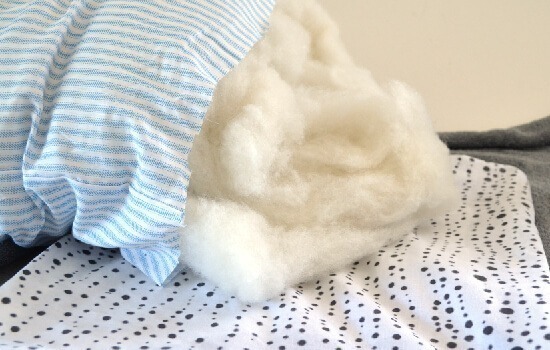 I’m reusing stuffing from a bedding pillow that was never used. I like my pillows to be really full but you can quit stuffing whenever you feel like it is at the thickness/density that you’d like. Use your chopstick to help bust up any knots in the stuffing that you can feel through the fabric cover. You can use stitch witchery and the iron to close up, but I always make a big mistake so I’m using fabric glue. 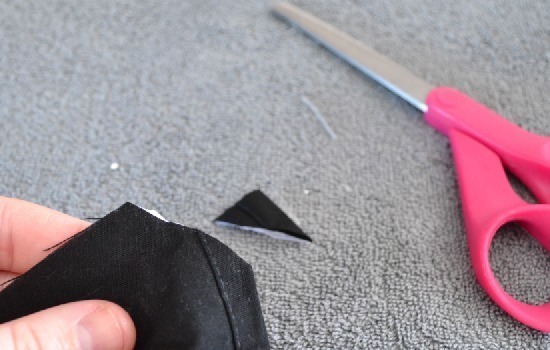 Simply squeeze a line of glue and then use your pins to hold tight whil the glue sets. When the glue is dry, carefully remove the pins. Here’s my pillow right after stuffing and closing up. It looks a bit lump and bumpy but if you smack it around a bit you can get the batting to even out. And that’s that! Unfortunately I went a bit too quickly and my pillow and my edges aren’t as nice as they should be. Take your time and yours won’t be as bumpy as mine is. When I first saw the photo I thought , where am I going to find napkins with that awesome pattern? 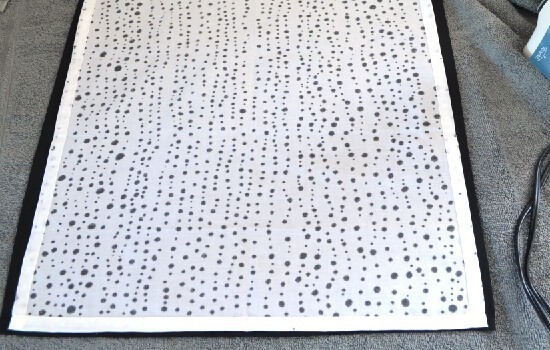 I can 't believe you drew those dots ! What kind of marker did you use ? Like I said the other day, "crazy-good ! " i got my napkins, placed the ”pretty” sides together and put the stitch witchery in its place. I then placed the damp rag over it, set the iron on wool and ironed. i waited 30 seconds aaaand…. the stitch witchery didnt melt( it actually stayed the same)and my napkins werent together. Hmmm. You aren’t doing anything wrong and I can’t understand why it wouldn’t do a thing with all of that heat unless your stitch witchery is old. I’ve had problems with an older roll not wanting to melt. You may want to buy a roll from a different store in case where you got it has old stock on the shelves, perhaps move it up to a heavier duty roll to be safe? 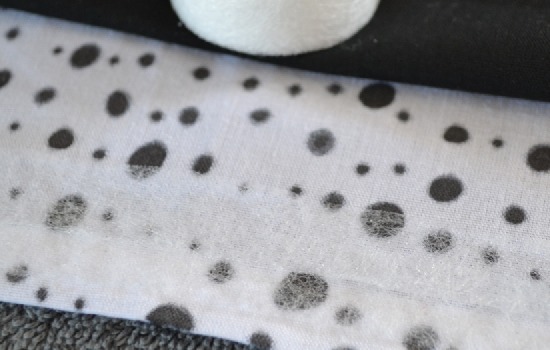 You can always use fabric glue as an alternative but that takes a while to dry fully so that you can turn the pillow case right side out and stuff. But it sounds like time is an issue, though in case it isn’t I thought I should throw the option out there!